BenQ announces new sub-£2000 4K HDR projector | What Hi-Fi? The W1700 will be available in January 2018, while BenQ also announced the UK launch of its W1050, an entry-level 1080p projector. Buying a 4K HDR projector has so far proved to be an expensive business. For those looking for a top-notch projector image, the award-winning Optoma UHD65 has been the best option, at £3000. However, that could be about to change with the BenQ W1700. It provides a 4K image using pixel-shifting technology alongside its native 1080p chipset from Texas Instruments. 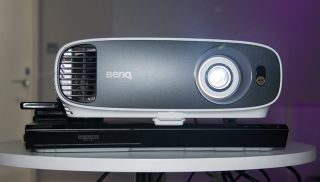 This technology has appeared in similar lower-budget 4K projectors before, however BenQ claims that, because of its close relationship with the manufacturing company, the W1700 will feature newer chips months ahead of the competition. The W1700 has a brightness of 2200 lumens, two HDMI connections (one of which supports HDCP 2.2-compliance for 4K pass-through), and 'flexible HDR support'. BenQ says the projector will support HDR10 out of the box, but we look forward to seeing specifically what 'flexible' means. Alongside the HDMI connections is a port to hook a PC up to it, as well as a RS-232 connection, a USB and 3.5mm jacks for audio output and input - played out of its in-built speaker. BenQ says the W1700 will be priced "under €2000" (£1780) and will be available from January 2018. BenQ has also announced the UK availablity of its latest 1080p projector, the W1050. Covering 96% of the Rec. 709 color space used in cinemas, it requires just 3m to project a 100in image. With a rated 2200-lumen output, a claimed contrast ratio of 15000:1, and 3D support (for those still sticking with the format), the W1050 is aimed at those looking for an inexpensive entry into home cinema. There's a 2W speaker built-in, too, although we'd recommend hooking it up to something a bit beefier. The W1050 is priced at £600.